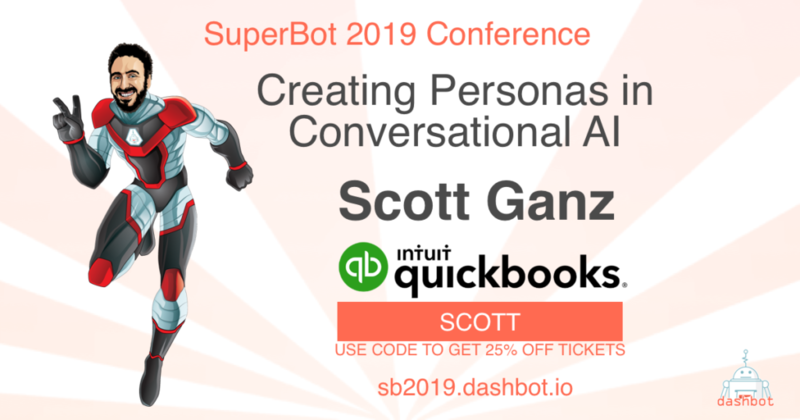 Intuit QuickBooks Principal Content Designer Scott Ganz will be speaking at SuperBot 2019 this spring to share his thoughts on crafting conversational AI personas. In a previous life, Scott Ganz was a screenwriter, who transitioned from writing appallingly cruel jokes about celebrities on Comedy Central to the family space, where he worked for the Muppets and PBS. It was while working on WordGirl for PBS kids that Scott won an Emmy for outstanding writing in animation. Scott then brought his experience in dialogue and character to conversational entertainment, working for nearly 5 years at ToyTalk, AKA Pullstring. While there, Scott wrote, designed, and creative-directed conversational experiences for kids and adults, including original projects (The Winston Show, SpeakaZoo) as well as work for major IPs (Thomas & Friends, SpongeBob Squarepants, Doctor Who, Call of Duty). These days, Scott’s working as a conversation designer at Intuit on the QuickBooks Assistant, the financial advisor chatbot.